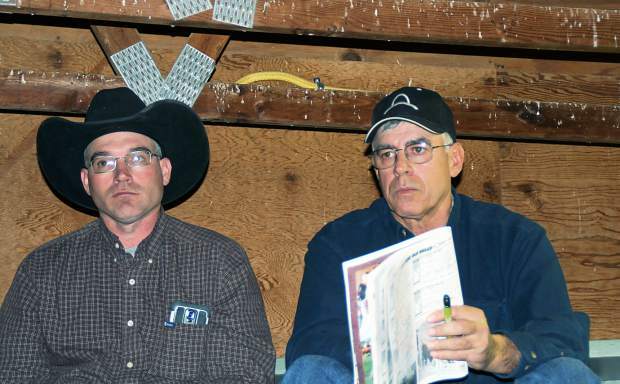 Garin Haak and Randy Knippling, repeat Ridder Hereford bull buyers. A large crowd of buyers looking over the bulls at the Ridder Herefords sale. 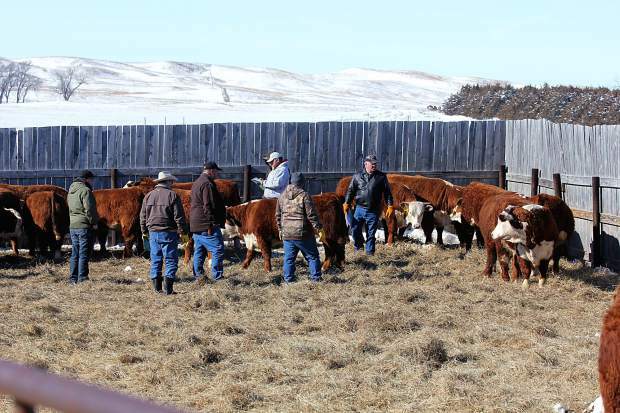 Ridder Hereford Ranch hosted their annual production sale on a sunny day following a major Nebraska blizzard. Bidding was active both in the barn and via Superior for their North Star brand Bulls and Starlette brand heifers. Topping the sale was Lot 4C, R 330A North Star 4C, selling for $15,000 to Jerry Knippling & Sons, South Dakota. Sired by CL 1 Domino 330A 1ET, 4C is a thick, eye appealing March calf from Ridders' 2016 Denver National Western Stock Show spring carload. He weighed 1,270 pounds and has an adjusted REA of 14.74. R 3203 North Star T45C was purchased by Bartling, South Dakota, for $12,000. This late March carload calf had an 800 pound adjusted WW, a 42 cm scrotum and top carcass EPDs with an adjusted REA of 14.91. R 2Y North Star 25C sold for $10,500 to Lilybrook Herefords/Andy Schuepbach, Alberta. 25C is thick, has an adjusted REA of 15.93, has lots of style and substance, and is out of a tremendous, young 0141 Dam. High selling R 0141 North Star 50B went to Knippling for $17,000. 50B has outstanding carcass ratings: 5Star REA and 5Star IMF and is out of Ridders' best old cow with progeny ratios of 110 WW and 112 YW on 10 head. R 0141 North Star J10B sold to Skrdla, Nebraska, for $15,000. 10B is stacked with DOD and SOD pedigrees and has a 5Star REA rating with a .53 REA EPD. R 1193Y North Star 65B was purchased by Knippling for $10,500. This April bull has super carcass figures with a 5 Star rating for REA and Backfat, has lots of volume and is out of a top 0141 daughter. Topping the heifer sale was R Starlette 513, out of a Sensation x 102W daughter. She sold to Patterson, Texas, for $4,500. This stylish heifer weighed 802 pounds, has superior carcass ratings and an adjusted REA of 10.75. R Starlette 500 sold to Witthuhn, Nebraska, for $4,250. This female has excellent carcass EPDs and is the paternal granddaughter of Ridders' breed-leading 157K. R Starlette 585 sold to Patterson for $4,000. She's an April calf and an 0141 paternal grand-daughter and earns nearly a perfect 10 for performance. Ridders wish to thank everyone who attended their sale, who bid and bought.